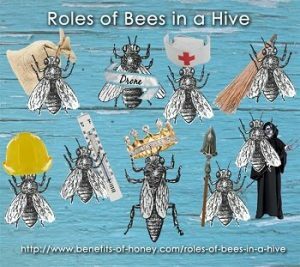 The queen runs the show in the sense that she provides all the bees on a hive. Although there are thousands of females, none of them but the queen are fertile. After mating once, the queen spends her 3-4-year lifespan laying eggs-about 1,500 per day- and will die when she can no longer produce offspring. A queen can lay up to a million eggs in her lifetime. She has special attendants-a dozen or so-that care just for her. The drones are the only males bees on the hive, and they live to mate with the queen. Hatched from an unfertilized egg, drones are stinger-less, cannot carry pollen, and serve no purpose in the community but to mate and eat honey. Before the famine of the winter months, they can be banished from the hive and starve to death. A drone can mate with neighboring queens to spread healthy genes. The foragers are the most prestigious category of worker bee. Foragers are responsible to locate, collect and deposit pollen which will provide food for the entire hive. They can cover a three-mile radius searching for pollen, nectar and water, which it carries back to the hive in pollen sacs on their hind legs, and stomach. Foragers will work until they die from exhaustion-about 45 days. Nurse-these workers tend to the care of the growing brood and newly hatched bees. They can also distribute honey high in antibiotic properties when the colony is threatened by impending infection by a parasite. Guard-the guards protect the hive from intruders with their powerful stinger, allowing only hive residents in and resisting “robber bees” who come to steal honey. They also protect against wasps and other predators, including humans. Hive Worker-these bees do everything else including producing wax to create the famous honeycomb cells we are familiar with, producing heat and air conditioning, and removing dead bee bodies when they must. The life span of the average worker bee is 6 weeks.